Are the cartridges numbered P1102 and P1102w exactly the same? I have a HP LaserJet P1102 printer. It's broken so I'm looking to replace it. Will the same cartridge fit in a HP Laserjet P1102w printer? How much money are HP Laserjet P1102 black toner cartridges sold for? We have various types of HP LaserJet Pro P1102 black toner cartridges as listed above. All of our current prices are listed beside each of the HP LaserJet P1102 cartridges on the right-hand side of the page above "Add to basket". For the HP P1102 LaserJet printer, is there an XL cartridge or not? I would like a quote on the price of a HP LaserJet P1102 toner? The cartridge number is RH-OCE285A? The HP LaserJet Pro P1102 printer uses the HP CE285A black toner. We currently stock a single genuine HP CE285A black toner cartridge and a twin pack of genuine cartridges or we stock a compatible CE285A black toner cartridge which is a non-HP cartridge. All of the cartridges and current prices for LaserJet Pro P1102 toner are listed on this page. We don't recognise the specific cartridge reference you've provided although this is likely to refer to a compatible HP CE285A toner from another retailer. I've refilled the cartridge of my HP LaserJet P1102 but the print is still dim and it's still giving a warning about "low cartridge". What's the solution? In this instance, we believe that the solution would be to purchase a new cartridge for your HP LaserJet Pro P1102 printer. We don't recommend refilling toner cartridges yourself as this can lead to problems. However, we do supply compatible HP LaserJet Pro P1102 toner cartridges which have already been professionally remanufactured and give you a cheaper alternative to using genuine HP cartridges. We strongly recommend that you try our premium brand recycled HP P1102 toner cartridges rather than refilling the cartridges yourself. How do I know if my printer HP LaserJet P1102 needs a cartridge or a toner? What's the difference? Is LaserJet P1102 and Laserjet Pro P1102 the same item? Thanks, Marie. The term toner and cartridge refer to the same thing. We sell two main types of cartridges, ink cartridges or toner cartridges. If you have a LaserJet printer you'll need to buy a toner cartridge. This page lists the toner cartrigdes that work in the HP LaserJet Pro P1102 printer which is the full name of the printer. LaserJet P1102 is a shortened name for the same printer. Can I use colour cartridges in the HP LaserJet P1102. It only came with a black and white cartridge? The HP LaserJet Pro P1102 is a monochrome laser printer and can only use black HP 85A toner cartridges (as listed above). i want to know if there is a coloured HP LaserJet Pro printer (P1102)? There are colour HP LaserJet printers available. 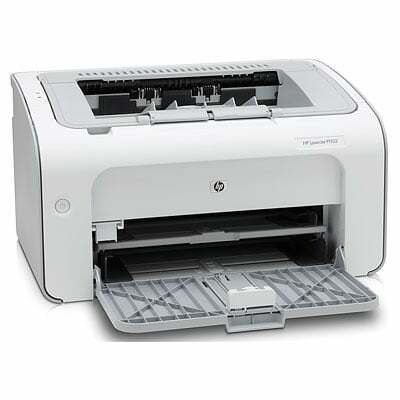 However, the HP LaserJet Pro P1102 is a mono laser printer so it can only print in black and white. I have a HP LaserJet P1102 printer. Please tell me how many pages I can print with the HP P1102 printer cartridge? The black HP 85A toner cartridge (genuine or compatible) for the HP LaserJet Pro P1102 can print approximately 1,600 pages at 5% coverage. We also have a twin pack of HP 85A toner cartridges so you'll get double this amount if you opt for the twin pack. How many black and white copies can we expect to get from the LaserJet Pro P1102 cartridge ie. how much would it cost-per-page? The capacity of the black HP 85A toner for the LaserJet Pro P1102 is 1,600 pages @ 5% coverage. You can see the current price quoted in 'pence-per-page' next to the price of the item. Please see above. Do you offer refilling cartridge services for the HP LaserJet Pro P1102? Unfortunately, we do not refill cartridges. We're a supplier of refilled and reconditioned items but we cannot provide cartridge refilling services. Where do you search when you want to buy HP P1102 toners? If it is only the best quality replacement toner cartridges for the HP P1102 printer which you're searching for, it's so obvious who the clear choice is. At Cartridge Save you'll not get any products except for high quality laser printer cartridges that were specifically produced to work in the printer. If you would like P1102 laser supplies you just never have to keep worrying about, buy at Cartridge Save today. We are sincere when it comes to supplying brilliant value for money on top of efficient customer support. You'll get complimentary delivery on anything you buy on Cartridge Save! We're very pleased of that 98% of all purchases will arrive the following day. You can be assured of complete peace of mind when you place an order with Cartridge Save courtesy of our extensive 12 month cashback promise. If you have problems using your HP P1102 laser toner cartridge inside 12 months after purchase just post it back for a total reimbursement. Get the highest quality cartridges and spend less at Cartridge Save! The HP LaserJet Pro P1102 laser printer is an old school model that specialises in monochromatic printing. It's perfect for environments that only need to print text, and its limited functions make it small and compact enough to sit on a desk without being invasive. Despite the increasingly popular array of colour laser printers, there are many offices that spend their days simply producing pages of black and white text. The HP P1102 is just the kind of printer for these office environments, as it's one of the best monochromatic lasers on the market. It does one thing, and it does it with high quality and speed. The HP is rated by its manufacturer at 17 pages per minute, putting it in line with other monochromatic laser printer models and making it a sound choice for an office environment. However, many might find that this model is capable of going above and beyond the expectations set by HP, as it was able to produce a very respectable 23 pages per minute during one printing speed test. That's a highly efficient printer, even among monochromatic models. Thanks to HP's thoughtful design, installing a replacement HP P1102 toner is quick and easy. One detractor when it comes to the printer's impressive speed is that the included paper tray only holds up to 150 sheets of regular laser printer paper. This low capacity could deter users from purchasing the printer and detract from its excellent page per minute rate, as it would only take a few minutes of printing before a paper refill is required. However, given the machine's price and efficiency, as well as its inclusion of a specialty paper tray for envelopes and non-traditional documents, it is an inconvenience that can be easily overlooked. Home and business users alike will appreciate that the low price point doesn't result in a lack of features like networking. The HP P1102 supports both wired and wireless networking and pairs well with a wide variety of routers. Setup is easy, and the many computers in your home or office will be able to share the printer in a matter of minutes. This inclusion of wired and wireless networking is the icing on the cake for the HP P1102 monochromatic laser printer; combined with its faster-than-expected printing rate and its very compact size, it's a no-brainer for offices that don't require the high-resolution colour printing of more advanced models.